Monday, April 5, 2010: Left Ocean Pines RV Park at Oceana Naval Air Station and wound our way through Virginia Beach toward the Chesapeake Bay Bridge-Tunnel. This 23 mile roadway connects Virginia Beach with the Delmarva Peninsula by a series of causeways, artificial islands, bridges and tunnels. When I was stationed here on a Navy frigate back in the 70’s we sailed by Thimble Shoals and over the tunnel many times. I remember the Bay Bridge-Tunnel looked odd on Radar as the bridge portion appeared to stop abruptly as it entered the tunnel portion. On one occasion I showed a young sailor the Radar image and told him that the bridge had been dismantled. He thought about that for a minute and asked…..why? We stopped at the northern end of the Bridge-Tunnel and noticed the parking area was large, flat, well lit and allowed 48 hour stays. Might be a great future dry camping opportunity. 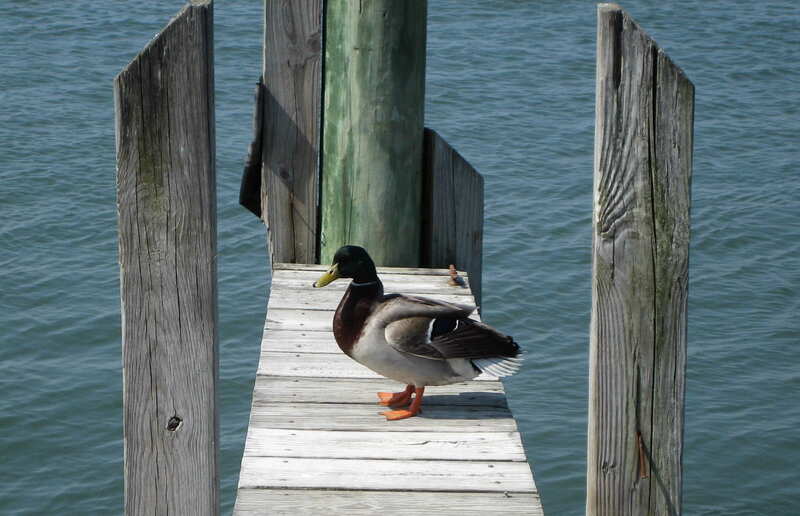 We both enjoyed the scenery and small towns as we traveled up the eastern shore of Virginia and on into Maryland. I had spent a lot of time in this area when I worked for Lockheed as we had a group of folks working at the Aegis facility on Wallops Island, Virginia. It had changed a bit but not as much as I would have thought. Still pretty rural. 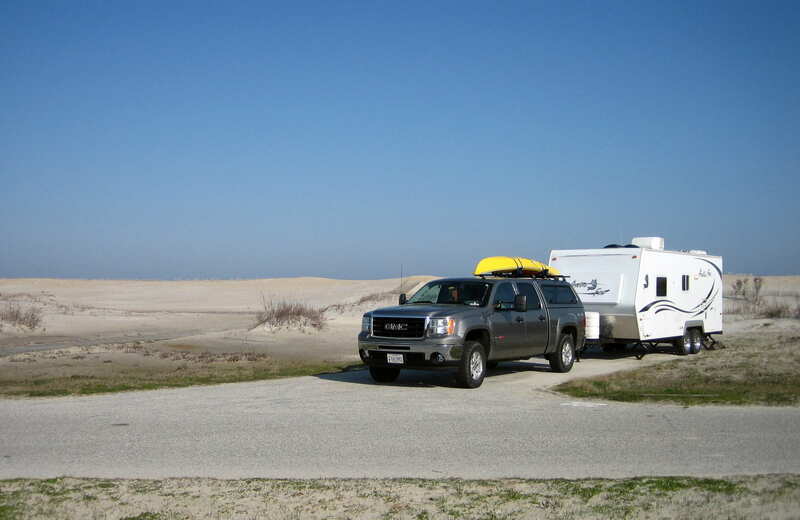 Pulled the rig into Assateague National Seashore and headed for the campground. We were immediately greeted by the famed wild ponies grazing about. 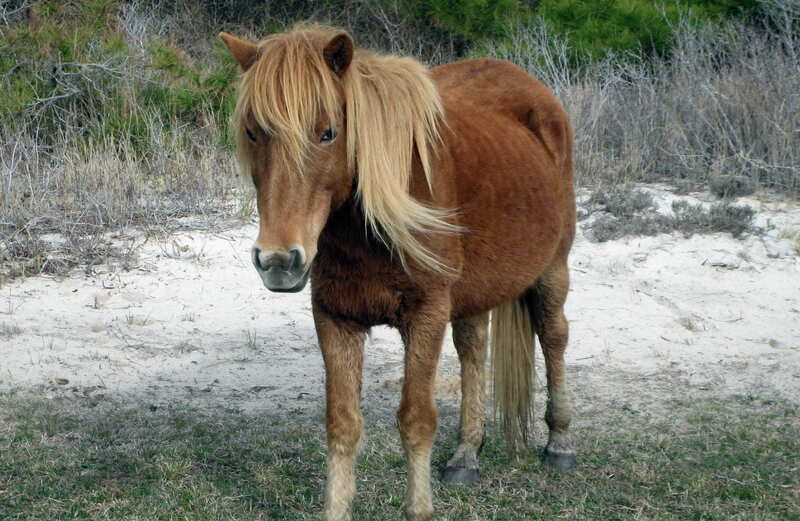 The ponies on this end of the island belong to, and are protected by the National Park Service. 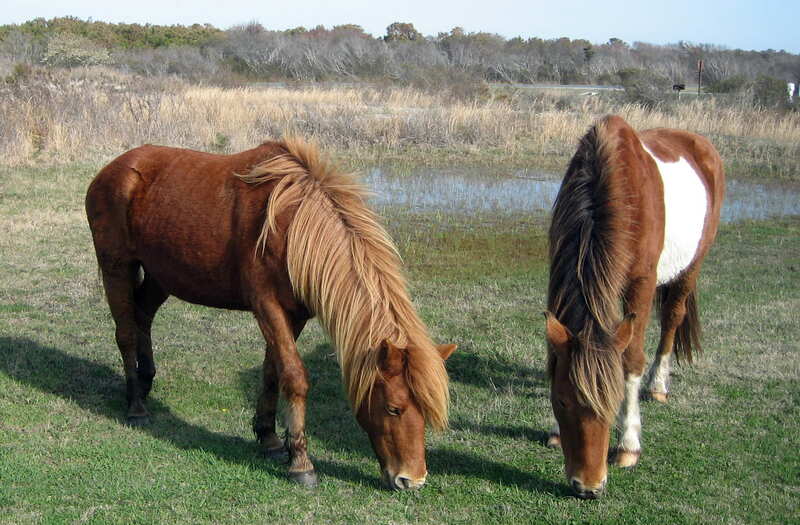 The ponies on the southern end of the island belong to the Chincoteague Volunteer Fire Department which holds an annual pony swim and auction to raise funds and manage the herd. 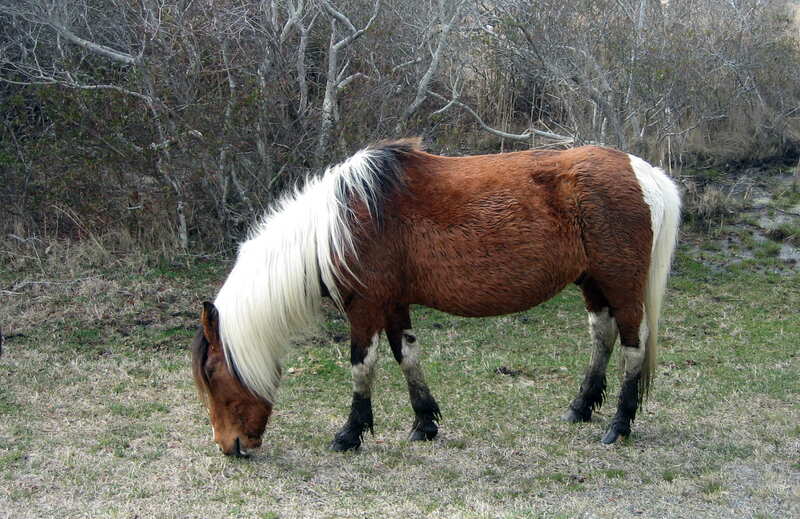 The Yankee ponies at Assateague don’t mingle with the Rebel Chincoteague ponies…..kind of like a Pony Mason Dixon Line. Being early in the camping season the park was nearly empty. We selected a really nice oceanfront site to use as a base for the next couple of days as we explore the area. Fell asleep that night to the sound of crashing surf while enjoying the fresh ocean air and listening to the ponies clop about. Around 0200 I woke to use the facility and then took a stroll outside. It was a beautiful starlit night and the moon was just rising in the east over the ocean. I couldn’t get a good photo of the scene but it was spectacular. Tuesday, April 6, 2010 to Thursday, April 8, 2010-Assateague National Seashore, Maryland: Up early, grabbed a flashlight and made my way over the dunes to walk the shoreline. 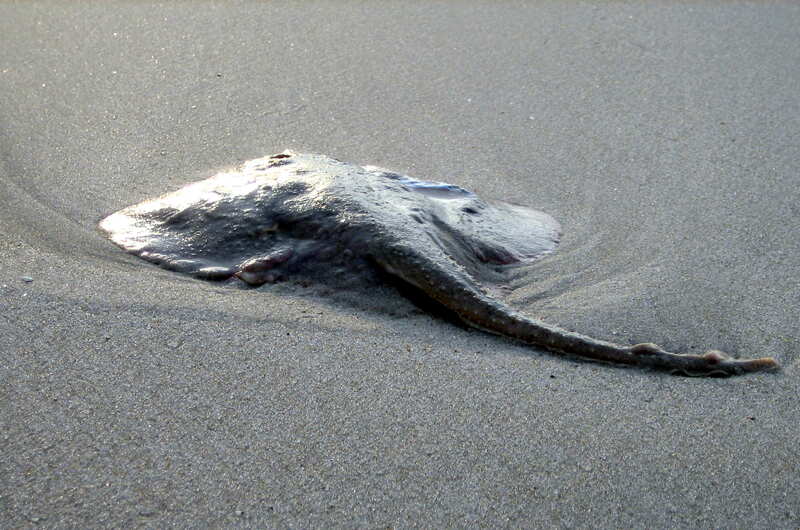 The sky was brightening in the eastern sky and I encountered a few sea creatures that had washed up on the shore overnight. 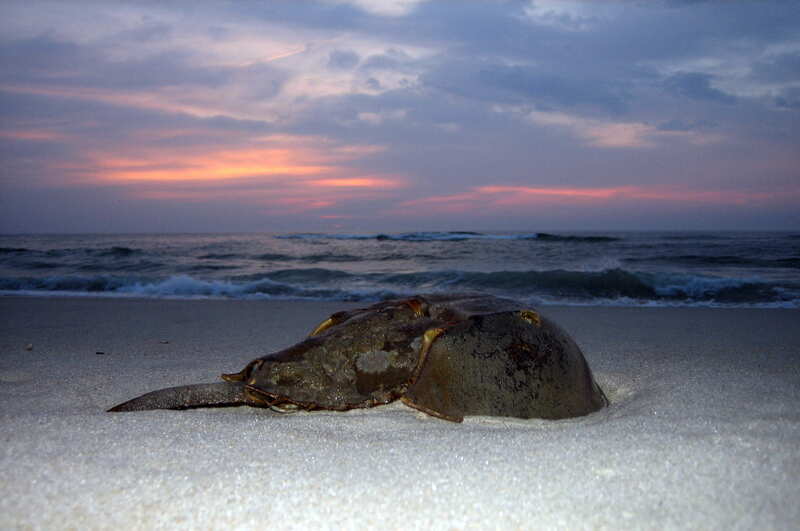 This Horseshoe Crab looked to be enjoying the sunrise as I was. 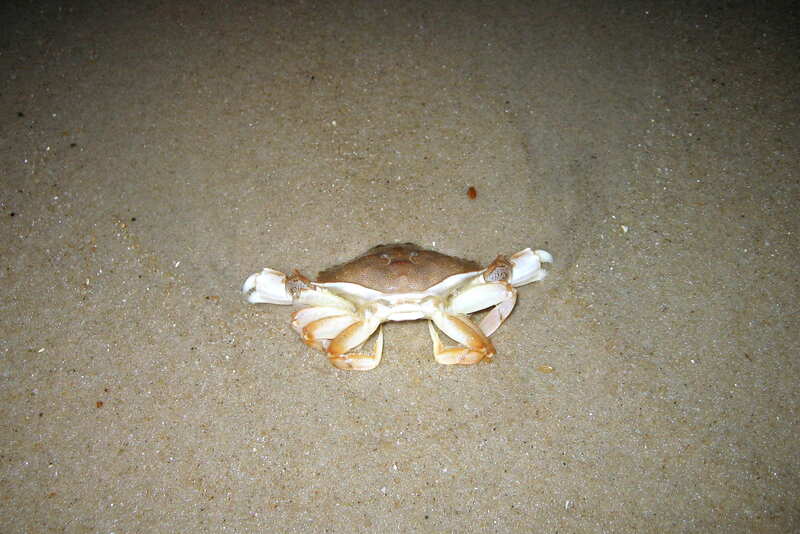 No wonder there were so many shoeless ponies what with the crabs grabbing all the horseshoes. As the sun rose above the clouds on the horizon the temperature started to rise rapidly. Walking along the shoreline I meandered back and forth to investigate various ocean animals and to look for interesting seashells. The temperature deviation I encountered as I moved from the warm air over the dry sand to the cool air over the damp sand was noticeable and quite striking. Kit enjoyed time on the beach as well but didn’t want to have any part in searching for washed up sea life or running into any distracted ponies. 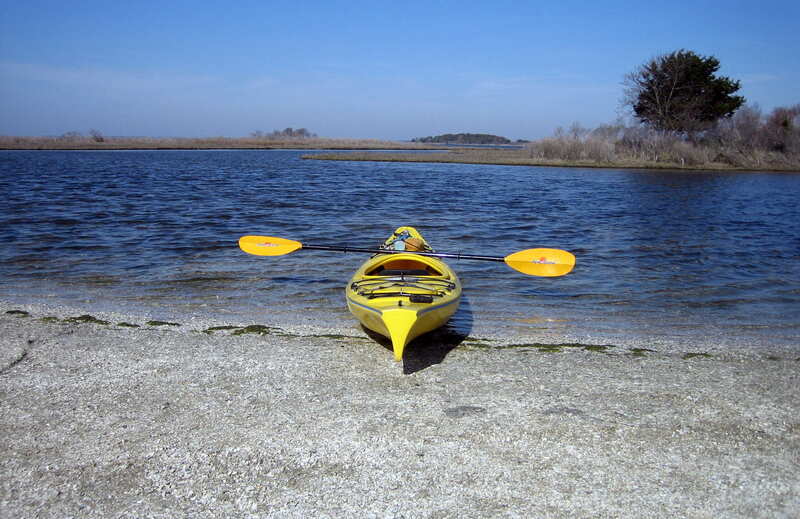 Assateague Island actually hosts two National Parks. In the northern Maryland portion is the National Seashore which hosts the public beaches, campgrounds and boating access. 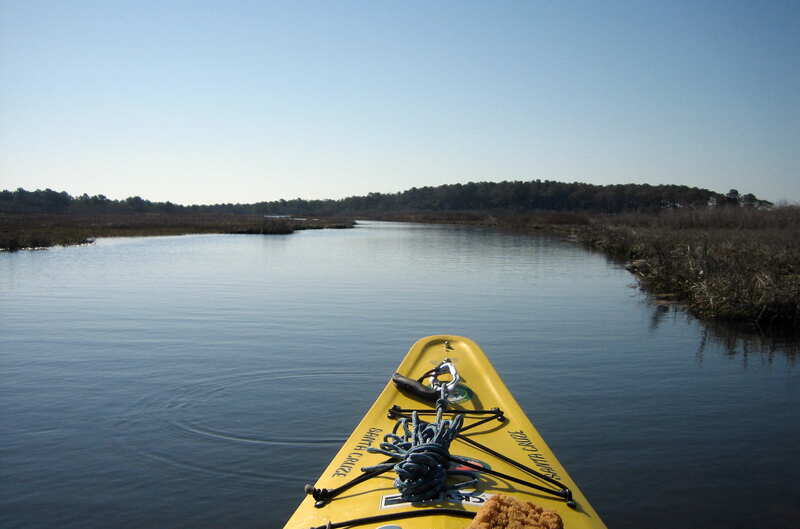 The southern Virginia portion is the National Wildlife Refuge which limits human intrusion. 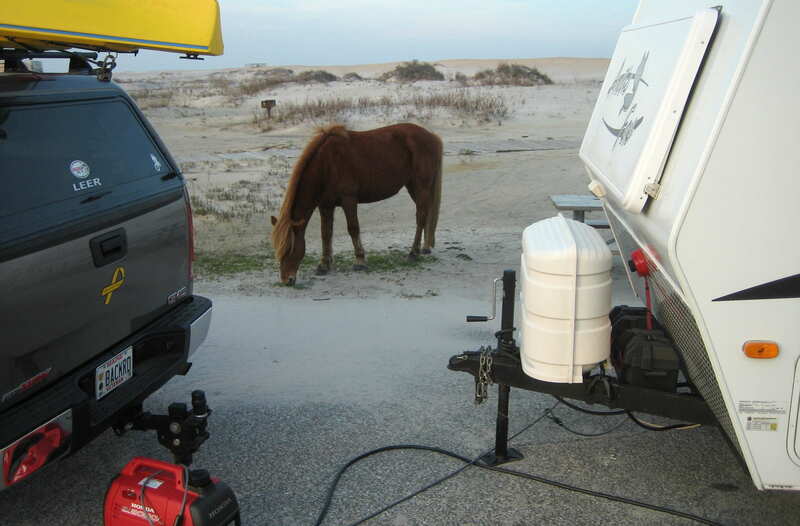 The wild ponies are everywhere in the National Seashore! We probably sighted hundreds of them all over the park. Hey it’s Spring Break, we’re at the beach, there are wild youngsters about…..time for another production of “Filly’s Gone Wild”. 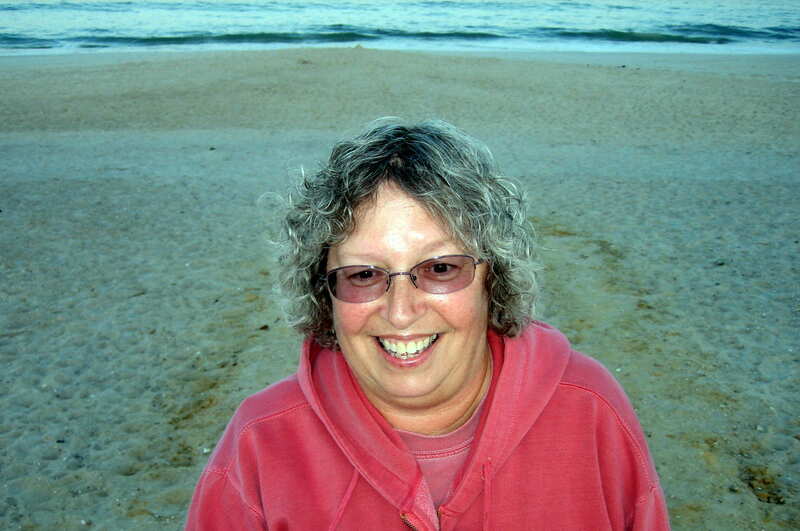 The barrier island of Assateague, Chincoteague, Wallops and Assawoman (Yep, Assawoman…..Google it!) 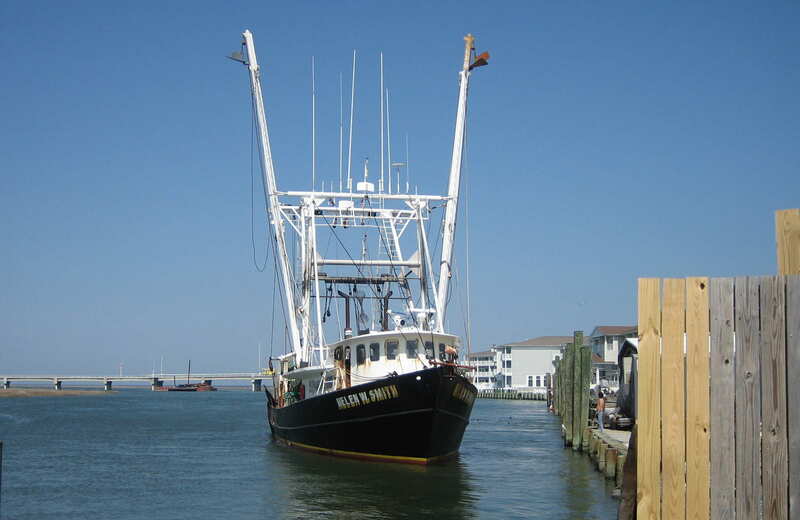 take the brunt of winter storms and protect the Delmarva Peninsula. Ironically the peninsula in turn protects the mainland of Virginia, Maryland and Delaware. 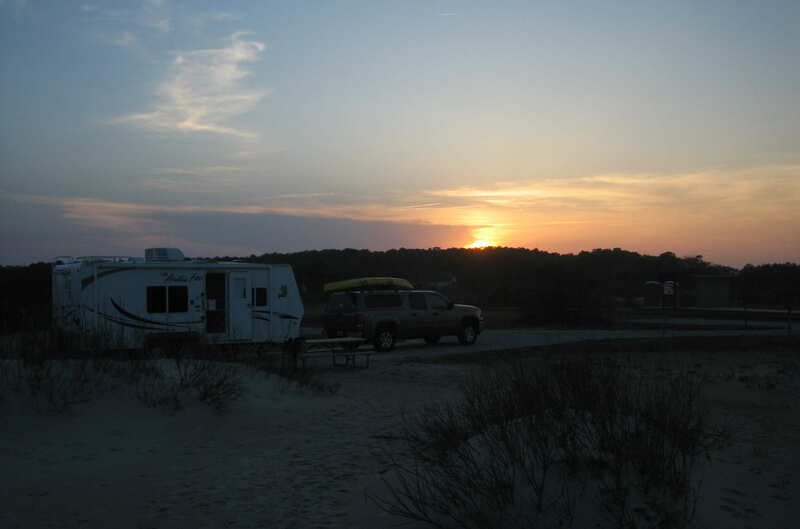 From our campsite on Assateague Island we also enjoyed great sunsets every evening. On one of the days in this incredibly beautiful place I decided it was time to break out the kayak and explore the western inlets and bays of the island. Now, when I kayak the rivers and lakes back home in Maine it is not uncommon to see wildlife like deer, beaver and bears along the shoreline. I have even come around a corner of a stream and face to face with a moose enjoying its meal of river bottom vegetation. But this is the first time that I have encountered a wild pony…..and it was on an island. Guess they do indeed swim. We took part of another day and drove into Ocean City, Maryland. 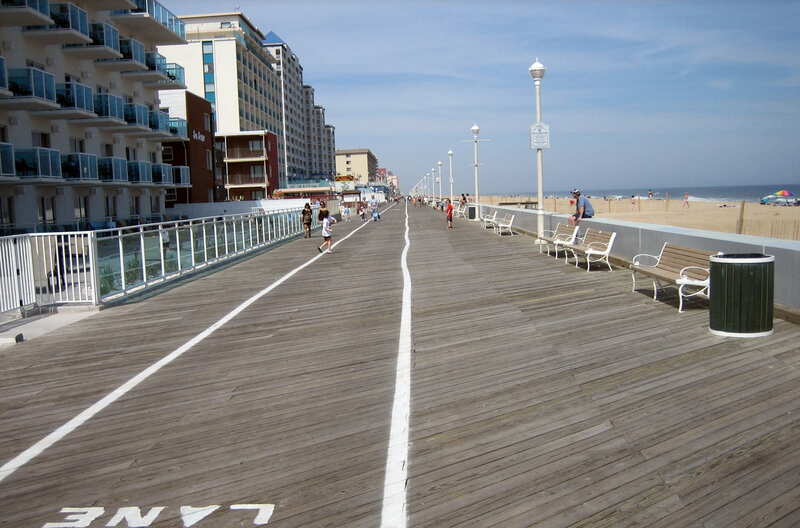 This locally famous resort area has one of the widest and longest boardwalks of any beach town in the US. 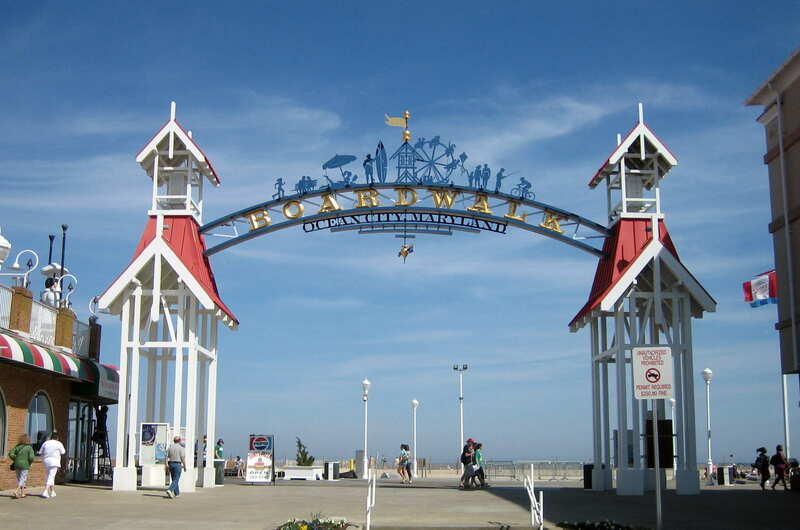 The 3 mile boardwalk contains an amusement park and many shops, restaurants, taverns, condos and hotels. Kit did some shopping while I sat in the sun and watched the few folks that were in town walk by. I did spot a surf shop however and went in to poke around. Turns out the owner was from our hometown of San Diego and though a few years younger than I, we knew some of the same people and surfed at many of the same spots. He offered me one of his personal boards (a 9’6’’ Hobie) but I declined as the water temperature was 54 degrees. Fun visiting with him however. Back when we camped on San Onofre Beach in California I was mesmerized by the brightly colored sport kites that were being expertly piloted by experienced fliers. After tons of research and the blessing of my dear wife Kit I made the plunge. 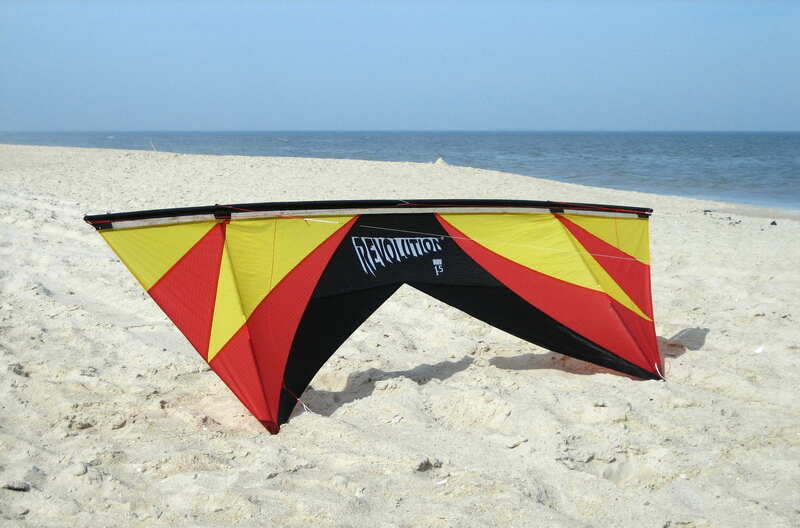 Picked out a Revolution Quad line Sport Kite. As the name implies it does indeed have four control lines and is incredibly maneuverable…..in the hands of an experienced flier. It’s big and powerful and after a number of hours practice I am still in what I like to call “the Charlie Brown crash phase”. 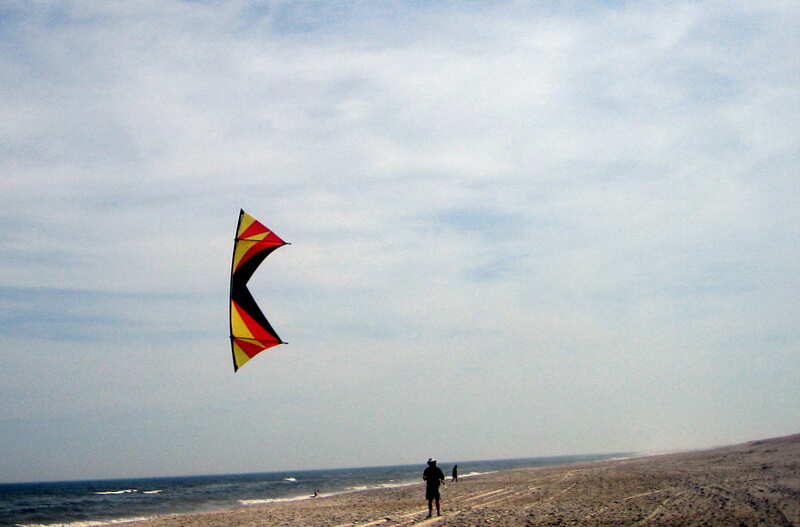 If you want to see how an expert handles the kite go to: http://www.youtube.com/watch?v=XWmh2TpzhLw. The Jack Johnson music is pretty cool as well. 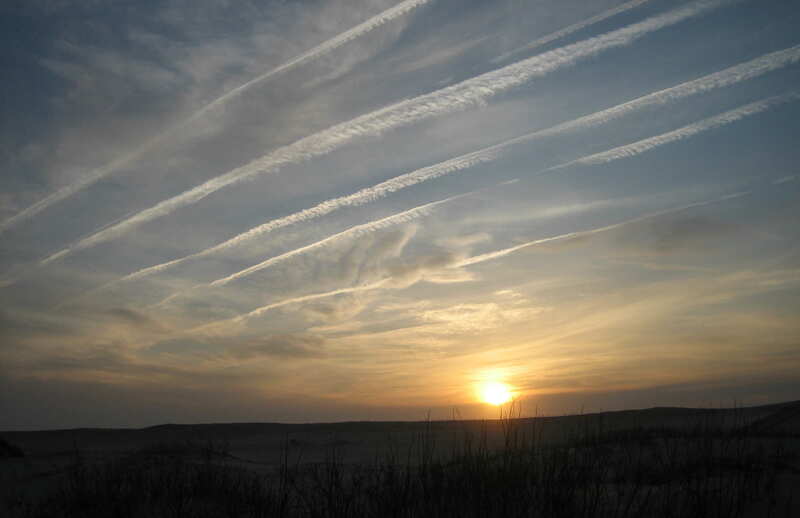 One morning as I was enjoying my beach stroll I noticed quite a few high altitude jets winging south. It seems odd in such a picturesque and peaceful location as Assateague that there are folks in large silver tubes hurtling towards Florida or some other exotic destination. If they only knew. On this mornings walk I surveyed and organized my large sea shell collection which I keep here on the Assateague beach as well as other locations. Further up the beach I spotted these fellow early morning risers. Returning to camp for breakfast I noticed a fellow camp resident enjoying breakfast as well. We took one day and drove south into Virginia in order to visit Chincoteague Island and Chincoteague National Wildlife Refuge. 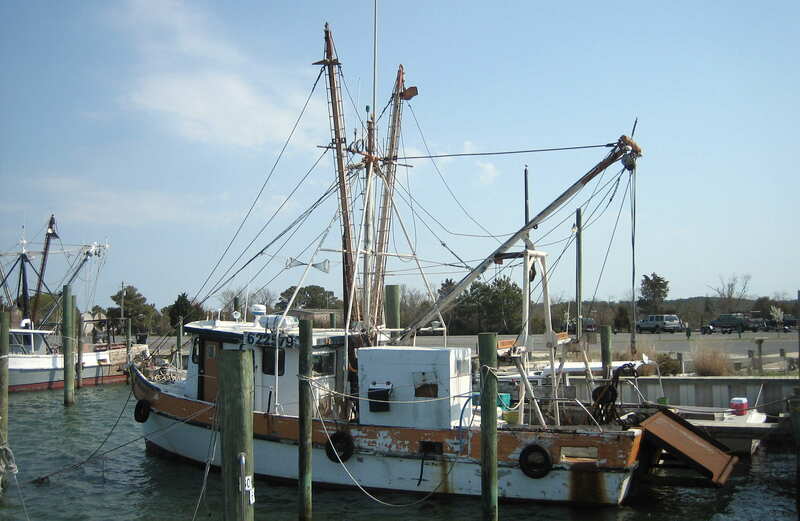 In the village of Chincoteague we had a great seafood lunch at Don’s Restaurant on the waterfront and then Kit went shopping while I oz’d around the piers. 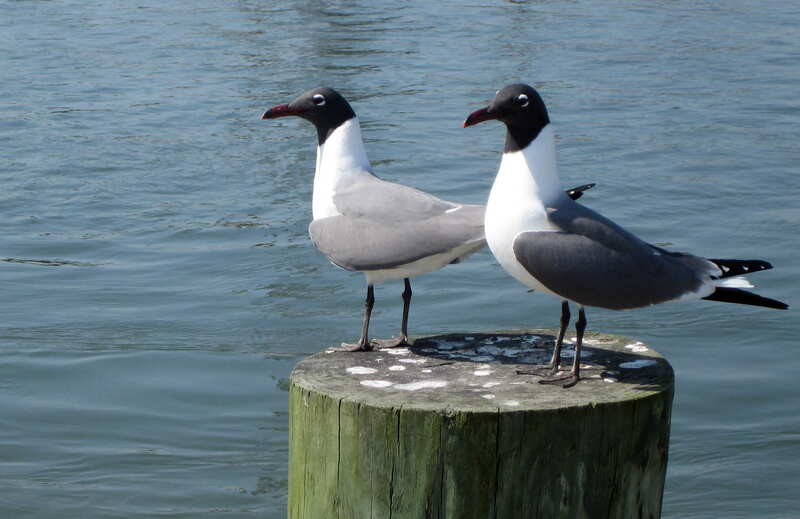 As usual, there were a number of gulls and other shore birds about. Following lunch we drove into Chincoteague National Wildlife Refuge which is located on the southern tip of Assateague Island. The refuge was established in 1943 to provide habitat and protection to migratory and nesting birds. In addition the park service manages the tidal estuaries and fresh water ponds for the benefit of these waterfowl. One large fresh water lake is called Snow Goose Pool and is the winter home for many northern Snow Geese. Driving through the refuge, we viewed many wild ponies as well as a few deer and various birds, gulls, egrets, geese and other shore birds. Most of the wildlife was too far away to photograph with my weenie camera but I was able to snap a photo of this Asian Elk fawn. 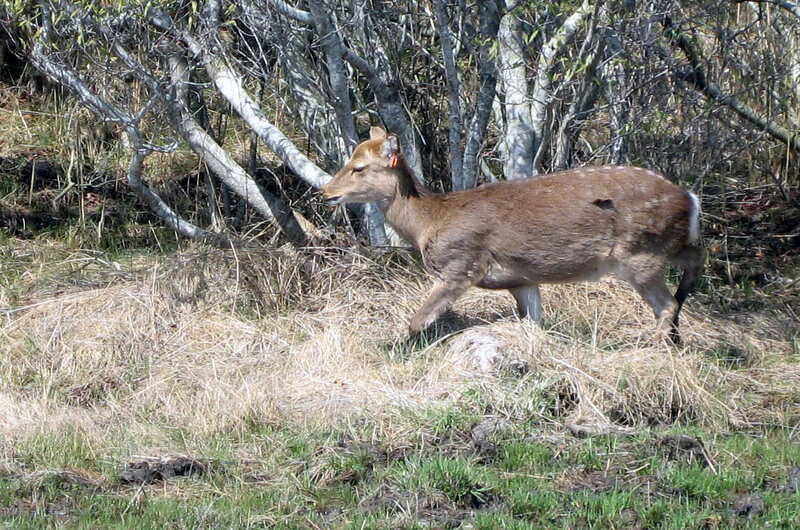 The Asian Elk (also know as Sika Deer) was introduced to the island in the 1920’s and have flourished. They are smaller than White Tail Deer but more aggressive which keeps most competing deer herds on the island quite low. 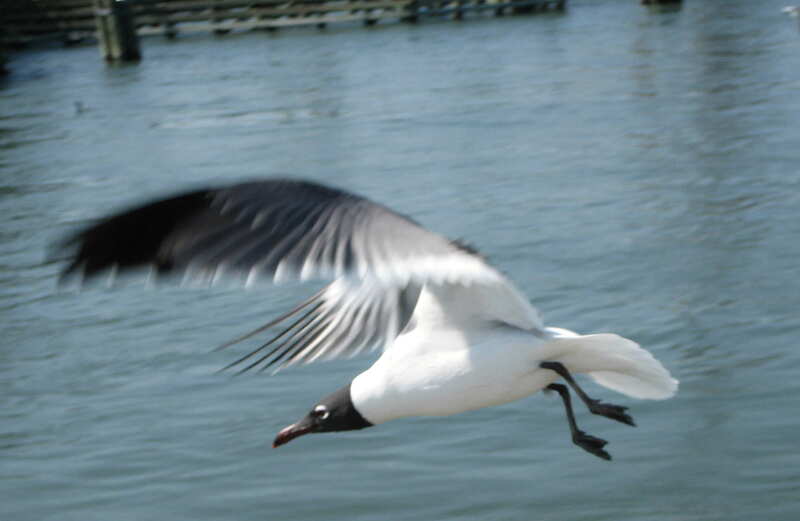 Seeing the flocks of birds that were making their way north to Chet’s dinner plate, I wondered why birds flying in a “V” formation always had one leg longer than the other (leg of the “V”…..not one leg of the bird; that would be weird). I finally figured it out. I carefully counted the birds in each leg of the “V” and discovered that there are a larger number of birds on the longer leg! Who woulda thunk? Returning to camp for our last night in this magical place we made dinner, took a walk on the beach and talked excitedly about the next stop on our trip……Philadelphia! Kit’s Corner: After travelling along the Eastern Shore back in our Navy days and always wondering what it was like, we finally got to spend some time there. It was absolutely beautiful and we hope to go back again. I could easily spend a week there. I also enjoyed the village of Chincoteague. Very quaint with lots of beautiful homes and tidy little yards. Not many shops were open but next time, maybe we will go a bit later in the season. Also thoroughly enjoyed the Visitor Center at the park. Hey fellow WordPresser….nice use of my photo. Those wild ponies were very friendly, probably due to so many tourist snapping photos of them. 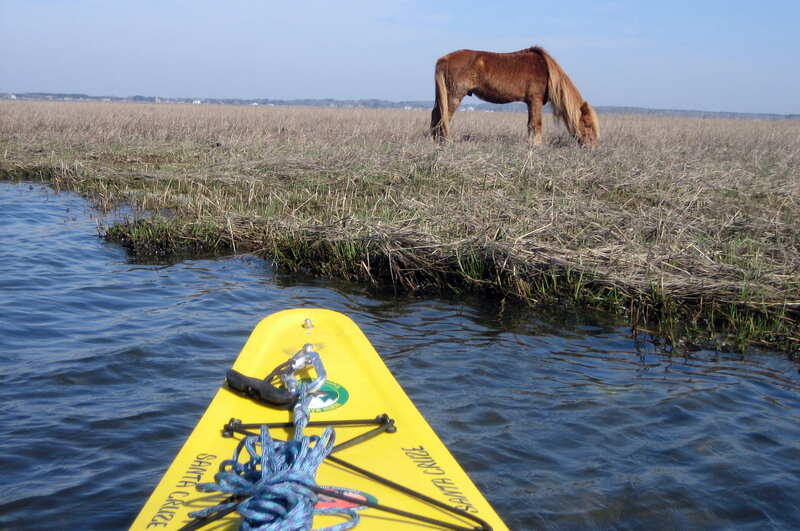 I was able to paddle to within feet of where they were grazing! Nice Blog by the way. Pingback: 100ks From Here | Why Didn’t I Take Photos? Hi, glad you were able to use one of my photo’s…..looks as if it fit your storyline very well!